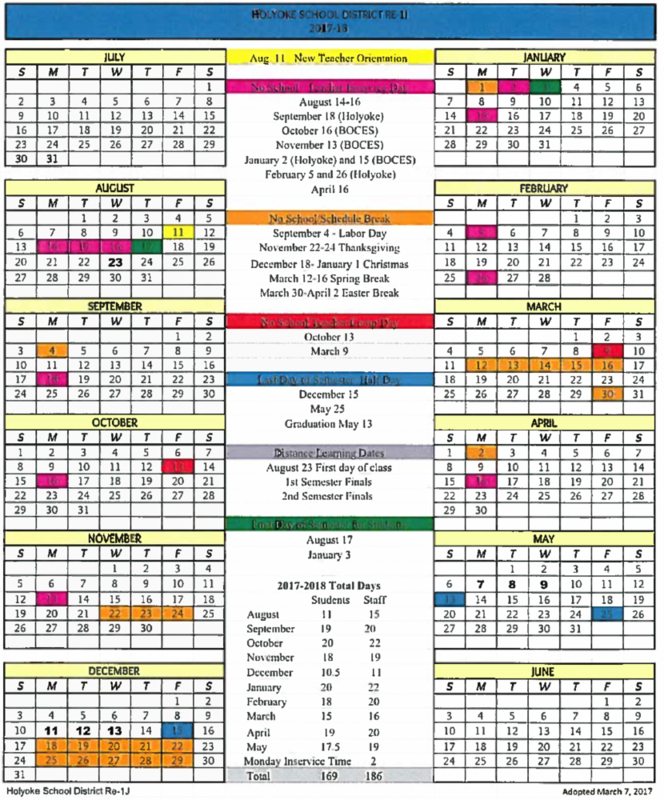 The Re-1J School Board has approved the calendar for the 2017 - 2018 school year on March 7, 2017. The calendar calls for students to be in school 169 days and staff to work 186 days. New teacher hires start the year on Friday, August 11th, the rest of the staff follows on Monday, August 14th. Students begin the school year on Thursday the 17th. The first semester ends on December 15th with a half a day for students and a full day for staff. The second semester begins with staff returning on the 2nd of January and students returning on the 3rd. The school year ends with a half day for students on May 25th and a full day for staff. The biggest change to the school calendar will be Monday late starts. Staff will begin their day at 7:25 and students will begin at 8:55. The inservice days have also been spread out through the school year in place of being front loaded at the beginning allowing for departments to work together on curriculum and giving time for new techniques to be applied to classrooms as they are learned. Staff inservice days in Holyoke include August 14 - 16; September 18; January 2; February 5; February 26; and April 16. The staff will also participate in the BOCES inservice days on October 16; November 13; and January 15. Scheduled days off of for staff and students include September 4th (Labor Day), October 13 (Comp Day for Fall Parent Teacher Conferences), November 22 - 24 (Thanksgiving), December 18 - January 1 (Christmas), March 9 - 16 (Comp Day for Spring Parent Teacher Conferences and Spring Break), and March 30 - April 2 (Easter).